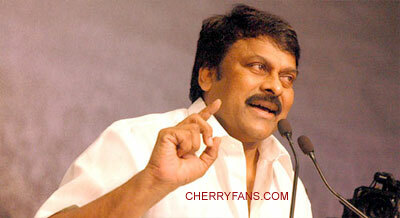 To me, there is only one hero in the Diaspora of Indian movies and that is Chiranjeevi. He is a true wholesome star with every possible character you can wish to see in a movie hero. He is the darling to millions of Telugu people and became a household name for more than 2 decades now. It is so heart wrenching to accept the fact that he is not going to act anymore and there is never going to be another anticipated release of his new movie. To his credit, he has quit from the film industry when he was at the pinnacle point and with highest degree of grace. His exit is as clean and perfect as his glorified career that spanned more than 25 years. To his admiration, he shifted his focus onto a much bigger, nobler, and further challenging stage – Politics. When I first heard of his intention to join politics, my spontaneous reaction was that “there is no political void in the state now. There are already two big players in the field right now and so there is no room for third player”. I lingered onto this notion for quite sometime until I recently saw him speaking to the media persons. He is so genuine, so humble and yet very confident. He is crystal clear in his mind about what he wants to do. His intentions are good and he is committed to them. He is motivated by real issues faced by common man, he is inspired by basic emotions and his spirits are so high, just as usual. If there is a real charismatic figure in AP after the legendry NTR it is none other than Chiranjeevi. I am sure no one might have felt that there was a room for second alternative to mighty Congress, until TDP evolved in 1983. Definitely no one even dreamt that NTR would win and reign over AP in 1983. So, “Voids are not realized until they are filled in”. Chiranjeevi’s movie entrance didn’t happen when there was a void of heroes. Tendulkar didn’t become a master batsman when everybody else got retired. So, “Voids are exposed, but never felt”. The raising tide always finds its way to percolate amongst the rocks. The shining star always makes its presence felt. New water always pushes the old water away. In normal terms - If you have the true will – YOU can make a difference. Now, enough of the emotional talk, let’s discuss some realistic logistics. AP people have seen both TDP and Congress over the years. Both parties did good and bad to the state. People have mixed feelings on those two parties as there are both positive and negative aspects with them. However there are still burning issues like farmers committing suicides, poor quality of education among government schools and poor medical facilities in the government hospitals etc. It is an axiom that government schools and hospitals are for poor people and of poor quality. The fourth and most serious cancer of the society is “corruption”. Unfortunately all these 4 ailments still prevail predominantly in our system. All the above issues can be eradicated if Government works with true consciousness (chitta suddhi). There is no rocket science here!! Chiranjeevi is targeting the above mentioned fundamental root causes in his agenda. This can be his first scoring point among the voters. Secondly, his character comes into picture. People just adore him for his noble persona. They associate him as one of us (manavaadu) because of his humble and down to earth nature. He is a self made legend hailing from a typical AP middle class family. He is one of the most non controversial elite personalities in India. He is never egoistic, always down to earth and shows high respect for elders and compassion for fellowmen. He is a pure family man and 100% teluguite. So he has a strong case to be considered for a first time chance. Third and very importantly – the factor of Youth and educated. It is not far from truth that even today elections in India are still decided by 100 rupee note and an arrack packet. After Chiranjeevi’s entry, a lot of youth started motivating themselves to register in the elections, started showing more enthusiasm in the politics. Also the IT people, NRIs etc are participating significantly in his march. This is very good and welcoming trend for the political process. This brings freshness and more practical ideas to the table. With India beaming with youth there cannot be a better moment for Chiranjeevi to kick off this movement. “Change is in the air” – It is interesting coincidence that Barack Obama is accepting his Democratic nomination around the same time in US. His slogan is in the same lines of Chiranjeevi - “Change we can believe in”. His wife Michelle Obama delivered almost a similar speech in Denver last night talking about how she and Barack hail from poor families ,came to this level by hard work and want to dedicate their lives to the down trodden. Both she and Chiranjeevi made striking references to their deceased fathers. Of course, we all know how dirty game politics can be. You need a lot of grit and vigor to stick to your principles. There will be more discouragers than supporters. It is going to be extremely interesting to see how Chiranjeevi plays his cards in his political adventure. Other sensitive issues like Telangana, Infrastructure and Law and Order can pose enough challenges for him. Will he get succumbed to the nuances of political tricks or will he stand out to be cut above all of them, which he did in Movie world. All in all, his new endeavor is going to be a true testament for mahakavi Sri Sri’s “Nenu Saitam”……..